Chemical principles are fundamental to the Earth sciences, and geoscience students increasingly require a firm grasp of basic chemistry to succeed in their studies. 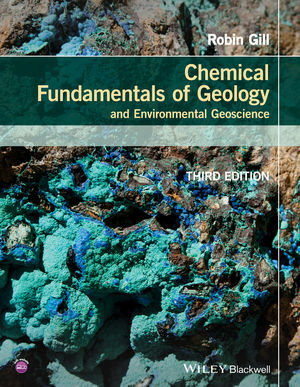 The enlarged third edition of this highly regarded textbook introduces the student to such ‘geo-relevant’ chemistry, presented in the same lucid and accessible style as earlier editions, but the new edition has been strengthened in its coverage of environmental geoscience and incorporates a new chapter introducing isotope geochemistry. The book comprises three broad sections. The first (Chapters 1–4) deals with the basic physical chemistry of geological processes. The second (Chapters 5–8) introduces the wave-mechanical view of the atom and explains the various types of chemical bonding that give Earth materials their diverse and distinctive properties. The final chapters (9–11) survey the geologically relevant elements and isotopes, and explain their formation and their abundances in the cosmos and the Earth. The book concludes with an extensive glossary of terms; appendices cover basic maths, explain basic solution chemistry, and list the chemical elements and the symbols, units and constants used in the book. "The book is beautifully produced with clear text, together with well-drawn and informative diagrams." (Proceedings of the Open University Geological Society 2 2016) "Gill's revised edition continues to provide a solid and readily comprehensible introduction to the scientific principles of chemistry underpinning geology and environmental Earth science."